Figure 7.38. Simplified scheme of hybrid nuclear thermal and chemical (LANTR) engine. "poor man'' version of VASIMR, but its thrust would be much larger, in the 10-ton to 100-ton range, albeit with Isp typical of chemical propellants or slightly larger. 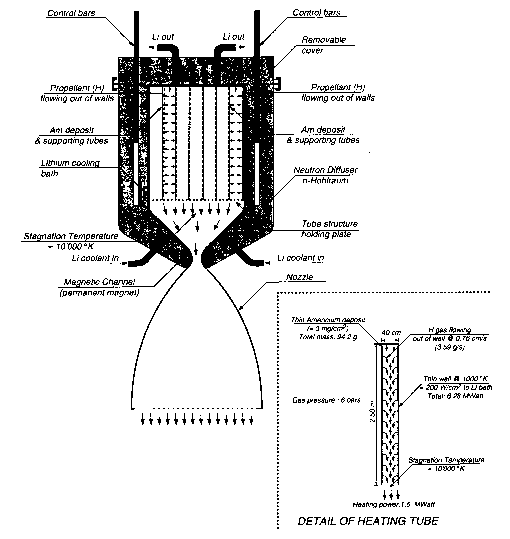 As developed by Glenn and his co-workers at GenCorp Aerojet [Glenn and Buhlman, 1999], this concept goes under the acronym of LANTR (Lox Augmented Nuclear Thermal Reactor). To increase reactivity, LOX should be injected inside the diverging part of the NTR nozzle, but not too far from the throat, because hydrogen must still be hot to ignite the LOX/H2 mixture and burn. There is a certain gain of Isp in this strategy, due to the higher hydrogen temperature with respect to conventional chemical LOX/LH2 rockets, and to the possible presence of atomic H (this radical accelerates chemical kinetics). Accordingly, the nozzle should be designed differently from conventional expansion nozzles because hydrogen and oxygen combustion takes place precisely there, inside the expanding supersonic hydrogen stream. The oxygen is injected subsonic (as a liquid), but combustion is likely to be mostly supersonic. This is the reverse of what occurs inside the SCRJ engines described in Chapter 4 (in SCRJ it is the hydrogen fuel that is injected inside the supersonic air stream), but issues such as mixing, combustion, and turbulence are very similar. The simplest scheme of a LANTR is in Figure 7.38, showing also the Isp and thrust calculated. The LANTR concept was first tested at Aerojet [Buhlman and Neill, 2000] using gaseous O2 and H2. Fission heating of H2 was simulated by using very rich H2 combustion (mixture ratios up to 7 were possible, but only up to 1.5 were actually tested). A total of 63 tests were performed at a chamber pressures of 30 to 70 atm: the thrust increased by 40% over the standard engine. The expertise of Aerojet in supersonic combustion was critical to the successful operation of the LANTR-simulated mode. "trimodal" strategy being currently analyzed at NASA-Glenn by the team of Borowski, see [Joyner et al., 2004]. Because the 7sp calculated is not much higher than 500 s, this concept looks promising only to boost thrust for short times. Its applications include emergencies, e.g., when aborting a mission, to speed up injection into interplanetary trajectories, to reach escape speed faster or even to take off from low-gravity asteroids or satellites, as suggested also in [Dujarric, 1999]. No mission analysis has been performed so far for a LANTR-powered vehicle. The work by Dujarric is apparently being continued, with the French aeroengine company SNECMA collaborating in a preliminary analysis of several hybrid strategies, including LOX augmentation but also plasma MHD acceleration [Dujarric et al., 2000].